Each time we visit a modern grocery store we experience the value of QR and barcode identification technology. Checkers no longer need to memorize and input thousands of prices and we all speed through checkout lines with our groceries faster than ever before. Store owners have also benefited from an integrated product-tracking tool for managing their inventories. But barcodes and QR code managers have so much more to offer. Barcodes have come a long way from their initial role as product identifiers and now play a key role as an engagement technology for marketers. QR code management by QodeScan and NeoSphere is helping businesses to bridge the distance between consumers and a vastly enriched digital marketplace. Whether they are used to trigger discounts, enter a sweepstakes, or to provide extended product information, mobile barcodes are allowing marketers to lead consumers on a more interactive journey with your brand. In the current digital age consumers are doing more product research on their smart phones and tablets than ever before. Shoppers have become accustomed to the enhanced digital purchasing experience provided by the latest apps on their mobile devices. Businesses are now rushing to design a more interactive digital shopping experience, using mobile barcodes to engage consumers, and a QR code manager to provide useful analytics. Some businesses need a self-service QR code manager like QodeScan, others require an enterprise level QR code campaign management solution like NeoSphere. Whatever your barcode or QR code manager needs, NeoMedia has a solution suited to your business. 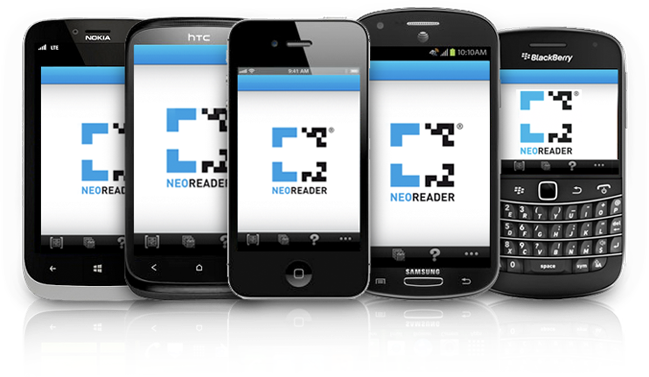 And if you are a developer who wants to add scanning support to an application design, then take our NeoReader SDK for a free 30 day evaluation!